Are you wondering whether there is a co-relation between the manufacturing industry and Internet of Things (IoT)? The manufacturing sector is all about making “things”, from clothes to cars, machines to household appliances and so much more. Internet of Things is connecting these “things” to a smart network through the use of sensors and actuators. Consider this –a refrigerator reads what you have stored inside and finds that you need to replenish milk supply and sends the information to your connected smartphone. This is a simple explanation of what the IoT is capable of doing. While we are busy looking at IoT from a consumer’s point of view and highlighting how it is going to improve consumer behavior, what we often neglect is how IoT can benefit businesses, especially the manufacturing sector. Modern manufacturing units have advanced systems and machines in place. Automated equipment, electronic controls have become the buzzword here. In this already advanced scheme of affairs, Internet of Things solutions can further help to improve efficiency, flexibility, and quality. 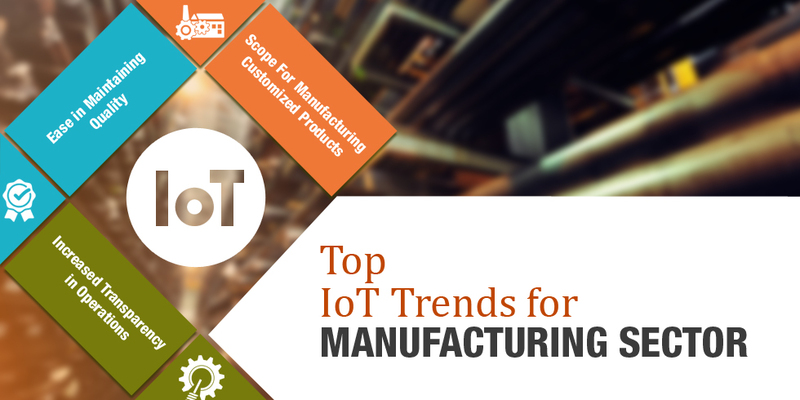 Let us take a look at what are the top IoT trends that are revolutionizing the manufacturing sector. Customers are looking for products which are manufactured keeping in mind their niche requirements. Manufacturers are doing everything they can to meet such high expectations, but this means an increase in the cost of production for the manufacturers. But with IoT, the cost of production doesn’t rise exponentially. Manufacturers will be able to adjust to the niche consumer demands by manufacturing products in smaller quantities without accelerating the cost. As more manufacturing machines are becoming computerized, efficiency and flexibility will increase, and there will be a complete sea-change in the way consumer goods are mass produced. With the help of intelligent machines, manufacturers will be able to detect faults in real time and improve the system before the problem escalates. Take for example a machine installed in a clothes manufacturing unit. Without the interference of IoT, checking the machine for faults would be a time-taking exercise and something that is seldom done. But with the help of Internet of Things, it can be regularly checked when the machine was last taken for maintenance. Another trend we can expect to become popular in the manufacturing sector with the increased usage of IoT is the level of transparency stakeholder will see. While production will remain within the four walls of the manufacturing unit, several other things will move out. The software used in the unit will move to the cloud thus enabling manufacturers, suppliers and also customers to view how things are being produced. They can view everything from the status of order, to see progress in real-time, inventory capacity, equipment and so on. That’s not all. Since we are talking about smart products, there will be constant customer-manufacturer interaction that will improve product performance, support, and maintenance. Read Also This: Revamp Mobile App Development Process with IoT & Unlocking the Technology Challenges for IoT IoT is poised to change business operations in a big way. There is no better time than now to jump on the IoT bandwagon. To get the best out of this latest trend, get in touch with Semaphore Software, a leading IoT App Development India. Write to us at info@semaphore-software.com to know more.